Air Astana has taken delivery of another Airbus A321neo, the fourth of the re-engined Airbus family of aircraft in its fleet. 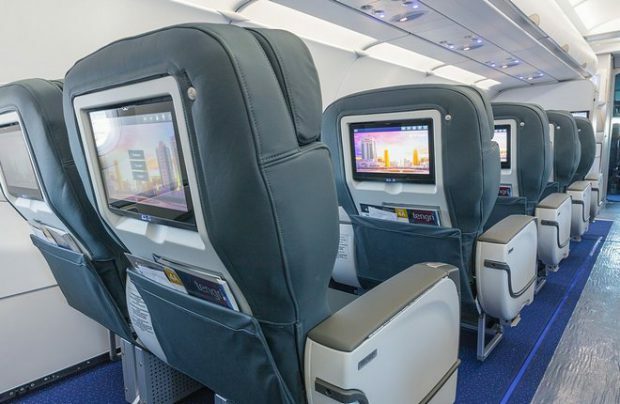 The new aircraft – which offers a seating capacity for 179 passengers (28 in business and 151 in economy class) –also provides the latest in-flight entertainment (IFE) system on all of its seats. Leased from the US Air Lease Corporation, the latest aircraft will be operated on Air Astana’s key domestic and international routes, including flights to Russia, Georgia, Turkey, the UAE, Central Asia and China. Kazakhstan’s national carrier is on track with its planned fleet renewal programme, the airline’s representative told Russian Aviation Insider. This year Air Astana will also take delivery of the first Embraer E190-E2 out of a batch of five it has on order. Scheduled for next year are deliveries of the remaining four E190-E2s as well as four additional extended range A321neoLRs, and five A320neos. In 2019 it will start to phase out its nine Embraer E190LRs as their lease terms expire. Additionally, it has three Boeing 787-8 long-haul aircraft on order, which are scheduled to arrive in 2021. All of the additional aircraft, both the A320neos and the E-Jets, are to be powered by Pratt & Whitney PW1000G geared turbofan family engines. With the latest delivery factored in, Air Astana has a total of 33 western-built aircraft in its fleet, including Boeing 767-300ERs, Boeing 757-200s, Airbus A320s, A320neos and Embraer 190s. Kazakhstan’s largest airline forecasts its traffic will reach five million passengers by the end of this year, up from the 4.2 million in 2017.